Hillary Clinton has joined Instagram. Clinton posted her first photo to the social media site Wednesday. 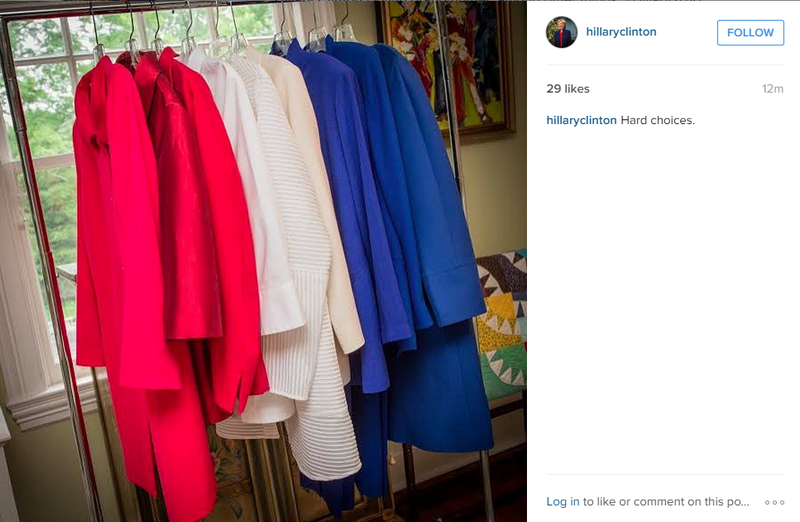 It does not show Clinton but, instead, red, white and blue outfits hung on a garment rack, highlighting a sartorial choice that the presidential candidate has become well known for: the pantsuit. "Hard choices," the caption reads. Many of the other presidential candidates, including Bernie Sanders, Jeb Bush (and his wife, Columba Bush), Rand Paul and Marco Rubio already have Instagram accounts. Clinton's account was private until Wednesday morning. Since the launch of her bid, Clinton's campaign has relied mostly on Twitter and Facebook to share photos of Clinton on the campaign trail, share news and highlight organizing events. She also recently joined LinkedIn. Clinton chimes in herself on Twitter on occasion -- both on policy and nonpolitical events like the Women's World Cup -- and signs her tweets with the letter "h." Clinton campaign officials say that the Instagram account will more regularly show a more candid, personal side of their candidate and her supporters. The campaign also plans to use it as another way to engage with her fans. Clinton, the former senator, first lady and secretary of state whose colorful Twitter bio includes both "hair icon" and "pantsuit aficionado," highlights only one of her titles on her Instagram page. "doting grandmother, among other things." It includes a link to Clinton's campaign website.